Today we’re back with episode number 82! 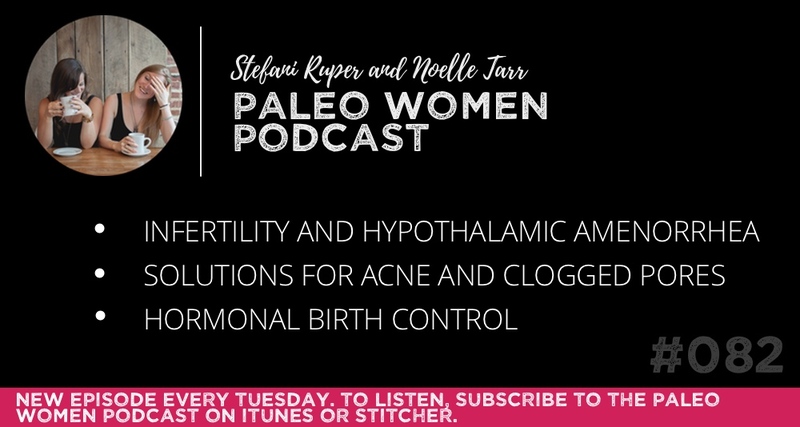 This week, Noelle and I discuss infertility and hypothalamic amenorrhea, solutions for clogged pores and how it relates to acne, and what to do about hormonal birth control. Vital Proteins offers 100% pasture-raised collagen products, as well as beef liver capsules. Their most popular product, Collagen Peptides, can easily be added to water, smoothies, teas, and soups for supplementation, and the Beef Gelatin can be used to make things like homemade gummy snacks or cookies. As a special offer for our community, Vital Proteins is offering a Buy 2 items, Get 1 FREE (of equal or lesser value) promotion on their website. Also, all US orders receive FREE shipping! To get this incredible deal, simply head over to http://www.vitalproteins.com and use promotion code “PWP” (all caps no spaces!) at checkout. PrepDish offers beautiful weekly meal plans to fit a gluten-free and paleo lifestyle. Consider it your meal planning “easy” button! Each meal plan includes a grocery list and instructions to spend only 2-3 hours on food prep for the week, and gives you everything you need to create 4 crave-worth meals, 1 creative side salad, 1 wholesome breakfast, 1 nutritious snack, and 1 delicious dessert. As a special back to school offer, PrepDish is providing our community with a free 2-week subscription to PrepDish. That’s an amazing deal! To get your free subscription, head over to: http://www.prepdish.com/paleowomen to take advantage of this offer. Thanks for your support, and for listening! We absolutely love being a part of your lives.